Get more ideas & resources! Have you signed up for Let's Move Faith and Communities yet? Let's Move! would like to stay in touch with you. 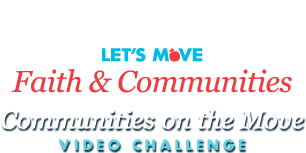 Let's Move Faith and Communities promotes physical activity and nutrition in faith-based and secular non-profit organizations. Learn more about how you can empower members of your organization to improve the health of our nation's children, and gain inspiration from models and success stories from partners across the country. Sign up here to be a Let's Move Faith and Communities supporter, and we'll connect your organization to more ideas and resources. This message is brought to you by Let's Move Faith and Communities, the U.S. Department of Agriculture (USDA) – Center for Faith-Based and Neighborhood Partnerships, and the U.S. Department of Health and Human Services (HHS) – Center for Faith-Based and Neighborhood Partnerships. If you have any questions about Let's Move Faith and Communities, please email collaborate@usda.gov.